I just love your hip hammock!!! Abby has just been diagnosed with congenital hip displacement on both sides. It's a bit sad, and it looks like treatment may be long and involved. But you'll be interested to know that her physio-therapist said that the hip hammock is about the best thing I could have done for her all of this time, as it holds her legs in a very natural, helpful position. The Hip Hammock allows me to interact with my daughter and talk to her more frequently and coSveniently than if she were in a stroller or in a backpack. For example, we point to things together, and I'll tell her what they are. She seems to learn vocabulary better this way. The Hip Hammock is something great to slip on for a quick errand around town. We live in Manhattan so pushing a stroller can be rather cumbersome. She also gets lots of extra hugs and kisses since her lovable cheeks are right there, conviently located! I received my hip hammock two days ago and I LOVE IT!!!! My baby girl is 5-1/2 months old and about 14 pounds. And while I am still able to use my front carrier, I won't be for long and there are times already when it's inconvenient. The hip hammock is the most amazing solution!!! 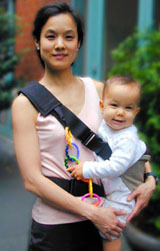 I have tried SOOOO many slings, but I'm very short -- 5' tall -- and so I always found them very uncomfortable. The hip hammock fits me just fine and has tons of added advantages! It frees up your most-used hand whereas slings cover all of your shoulder and a good bit of your upper arm, making it difficult to reach for things in cupboards, etc. The hip hammock allows me to eat while holding my baby without dropping crumbs, spilling, etc. In my front carrier, her head was always in the way! I love the little toy clip! I have a front-loading washer and dryer, and this way I can easily squat down, with my baby in the hammock, to do laundry. Her legs don't get in the way! I even put on my make-up this morning with Abby still in the hammock! She gets to participate! I love that I can snuggle with her and interact with her so easily -- her little face is right there to look up and smile at me, and I still have the front part of my body as well as my hands, free! Oh! And my husband can't wait to take her to the park this weekend in the hip hammock -- he'll feel more than comfortable wearing her in it! Thank you so much. I really am going to recommend this product to everyone I know! I just wanted you to know what a lifesaver your hip hammock was in China. We hardly ever used the umbrella stroller we brought along, since it was so much easier to just use the hip hammock. Lucy-Mei took many a nap in it! I still use it at home, especially when I just run outside for a quick errand. And, it is also handy in the house, since we have an old, old home that used to be two separate apartments on two different floors. Our house isn't "childproofed" yet, so I find it necessary to tow little Lucy-Mei around with me, and she is delighted to be my partner in crime! Anyway, I just wanted to let you know that I think of you and your great invention every day since I have had it! MERCI! I received my hip hammock a couple weeks ago and I'm hooked! Brooke and I went to Florida to visit my sister. The hammock was great in the crowded airport with a 3 hour layover! I could carry her in the hammock and my carry-on bag- no problem! I got something to eat at the airport and she slept in it while I paid and sat down and ate! Her little head rested in the crook of my arm! It was even great on the plane, since we boarded while she was still sleeping in it. I just loosened the straps and rotated her to the front and she slept in it while we flew! This left both hands free to read a magazine and drink a pop! Plus, it was safe to have her strapped to me in the event of turbulence. While in Florida, we visited a restaurant with my family. Brooke got extremely fussy. I finally pulled out the hammock from the diaper bag, and she INSTANTLY calmed down in it! I even nursed her in it as I ate dinner! Her mouth was at the right level after I adjusted the straps a little! She immediately fell asleep in it as I continued my dinner with both hands free! Today, I vacuumed and dusted the whole house while she sat in the hammock just looking around as content as can be! My back and shoulders felt perfect when I was done! Just got our Hip Hammock in the mail this morning and I don't know what I would have done without it! Callum (10 months) is sick and very clingy right now, so I have been able to do laundry and other chores that would otherwise have had to wait until my husband arrives home. Looking forward to being able to use the streetcar, bus and subway stroller-free! I recieved my Hip Hammock in the mail last week and wanted to tell you how much I love it!!!! I have only one major regret. I WISH THAT I HAD HAD IT FOR MY OTHER TWO BABIES! 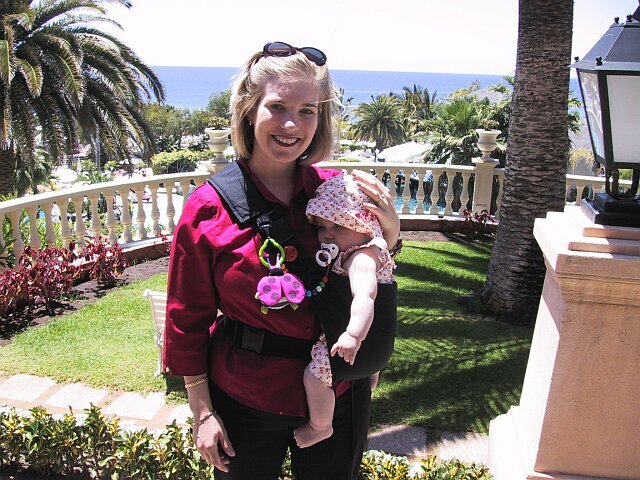 It is literally the absolute best baby carrier that I have ever tried, including baby backpacks! I put my 2 year old in the carrier to try it out and it is fabulous. The Hip Hammock has saved my life! I have a whopping 9.5 kg, 5 1/2 month old and many stairs to climb to reach my apartment - and it's going to be a long time before this baby climbs those stairs. 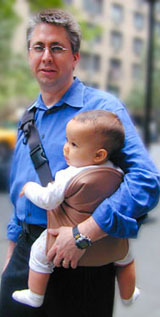 The Hip Hammock allows me to carry baby and groceries almost effortlessly. I always stow it away in the stroller so that I can slip baby into it to get to those spots that are so hard to reach with the stroller. Adrian was not happy any longer in the front carrier but he loves sitting on my hip and watching the world go by - it really is a very natural way to carry a baby. I already love it! I put my daughter in it and it must have been very comfortable because she was asleep within five minutes and continued to sleep for an hour in it! (This from my child that hates to nap!) I was thrilled. I will be sure to tell all of my mommy friends that it is a 'must have' item! I recieved the Hip Hammock yesterday evening and I have to say WOW! My baby doesn't know what hit him! He loves being in it, and has fallen asleep while in it twice already! A MILLION THANKS to you!